I’ve just taken a short trip to Bucharest. I specifically say ‘short trip’ because although I went across a weekend, I only really had a day and a half there because of the flight times. The main reason for the trip - as far as I was concerned - was to see the Christmas market. I’d done a bit of research beforehand and it looked great; lots of wooden huts in the pictures, everyone dressed for the cold weather and an ice skating rink. It really did look magical. Unfortunately I couldn’t find much out about it in English, and my Romanian is non-existent so I only had the pictures to go on. 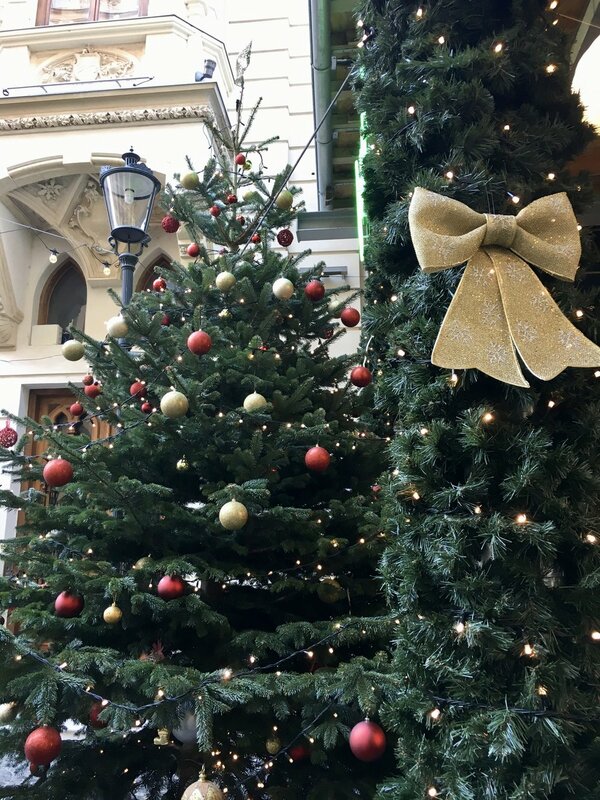 We went along to the market on Saturday afternoon, and were very excited to see an enormous Christmas tree marking the fact that we were in the right place. There was an awful lot of gluhwein on sale, and lots of fancy looking hot chocolates which looked delicious (I didn’t get a chance to try either in the end). The market itself was a little disappointing; it was quite small and although there was a good variety of stalls I’d thought it was going to be a lot bigger. I’m from Lincoln and the Lincoln Christmas Market was bigger than the one in Bucharest. Obviously that didn’t stop me buying a few bits and bobs, but I’d hoped to find some nice stocking fillers and unusual gifts for people and I ended up only getting a handful of things. And a necklace for me, but shhh. There were, of course, plenty of food stalls too, all of which looked very popular but we’d just come from brunch so we didn’t try and of the fare on offer. The main thing to note was the massive stage which had a variety of performers on. They weren’t particularly Christmassy but seemed popular, even during the afternoon. We actually returned to the market that evening, because we wanted to see it all lit up with the Christmas lights. It was a lot busier so we didn’t stay long; I would have stayed a bit longer to check out some of the other stalls and the entertainment but the others felt it was too busy and didn’t think we’d be able to get food there as the queues were too long. The market is held in front of the Palace of Parliament building - a huge, very imposing building that houses the main bodies of state. It’s claim to fame is that it's the largest administration building in the world (for civil use), and also the heaviest building in the world (you're welcome, fact fans). In fact, Bucharest has a lot of lovely architecture; we stopped to take pictures of a very pretty domed building, which then turned out to be a Bank! The old town is unsurprisingly the most attractive part of town, with buildings that have lots of gothic detail and are all quite grand. The further out you go the buildings become typically eastern bloc with lots of concrete. Speaking of nice buildings, the place we went for brunch on Saturday morning was incredible; and is a must see just for the decor. 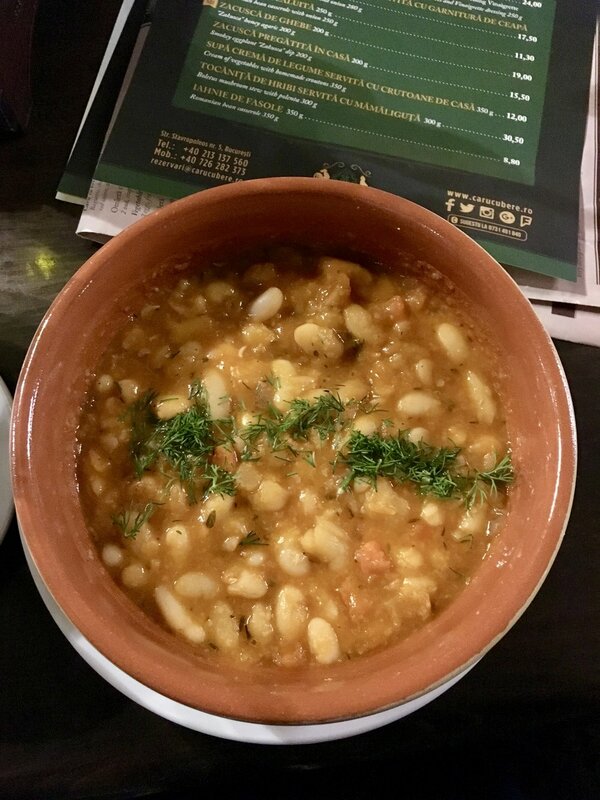 Housed in one of the beautiful old buildings in the old town, Caru Cu Bere serves a standard Romanian menu with things like pork knuckle and a variety of soups. I went for a bean cassoulet which was a little plain, but quite tasty. I can highly recommend ordering a hot chocolate though; it’s possibly the best thing I had during the trip. It was incredibly thick, almost like a chocolate soup, and was absolutely delicious. As we missed out on food at the market, we headed back into the old town for dinner on Saturday night. We ended up choosing a Lebanese restaurant called Finikia, where I went for a vegetarian platter of falafel, hummus and tabouleh. Middle Eastern food is one of my favourite cuisines, and I was quite impressed with this one. The portions were big and the falafel was obviously homemade, which was a bonus. I even got a mint lemonade which reminded me of times sitting on a beach in Abu Dhabi when I was a regular visitor there. One criticism of the restaurant was that just as we were leaving, the waiter came up to us and said we hadn’t put in a big enough tip. He suggested we hadn’t left 10% and was quite rude about us topping the amount we’d left up, so that he got the tip he wanted. Having been a waitress, I know that you can rely on tips, so my issue wasn’t with the fact that he wanted one; he was just a bit aggressive about it - or perhaps things were lost in translation a little. On Sunday morning we headed back to the old town for a visit to the Grand Cafe Van Gogh. We’d had this recommended to us by a couple who’d been to Bucharest several times, and I can recommend it to you too, now. It’s a very pretty little space with clogs and umbrellas hanging from the ceiling and, naturally, Van Gogh works on the walls. The menu was varied and had lots of styles of eggs for breakfast, sandwiches and desserts, as well as a drinks menu that went on forever. My eyes got the better of me and I ended up having pavlova for brunch, having seen one being served to a neighbouring table. 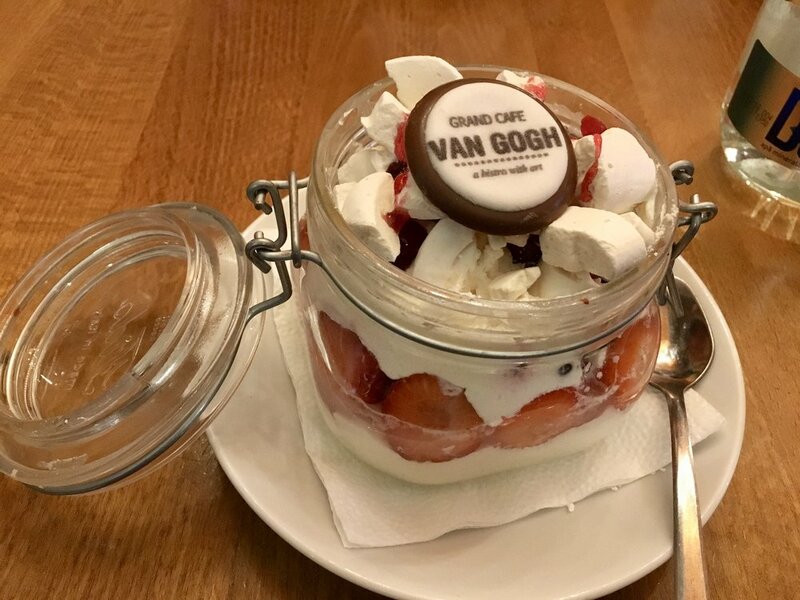 It was delicious, just the right proportions of cream, meringue and fruit - I was pleasantly surprised to find a mixture of berries inside as well as the strawberries arranged around the glass jar it came served in. I wanted to try one of the smoothies on offer, but the waitress never brought me one, unfortunately. Several of the others had them though, and said they were worth getting. Two of the group ordered yoghurt and muesli, and although it was nicely presented it was, apparently, a bit of a disappointment. So, as you can see, we did quite a lot of eating during our short time in Bucharest. Most meals cost around £8-15 including drinks, which I thought was really reasonable. The bean dish I had on Saturday morning was around £2 and kept me full all day, so you can definitely get by if you’re in a budget. We stayed at the NH Bucharest, which was a 10-15 minute walk to the old town. It’s rated 4* and had good sized rooms - as a bonus the mini bar was pretty cheap too, hurrah! It was in quite a quiet area, so I wouldn’t recommend it if you’re travelling alone, but it was nice enough and well located otherwise. One of my highlights was being able to try out some of the Romanian wine. My other half is a bit of a wine buff and I recently tried some very tasty Romanian Pinot Grigio from Asda, which has become one of my favourites - so much so that I’m considering it for one of the wines at our wedding. So I was pretty excited to see what else was on offer and tried a couple of really nice Sauvignon Blancs, and a nice, light Cabernet Sauvignon too. So would I recommend Bucharest? Yes - if you have a reason to go, such as the Christmas market or some other event. I’d like to go back to explore more of the city and it’s history, as we didn’t really get a chance to do that we passed lots of nice churches and the like. The Christmas market itself is nice, but I wouldn’t come to visit it as the main attraction again as I just thought it was too small and didn’t have as much to offer as I’d hoped. I’m actually considering coming back in the new year for a shopping trip, as there are lots of decent stores in the city centre and the exchange rate is pretty good. So, if you were planning a trip, id recommend a proper long weekend so you can really get a feel for the place. With flights (from Larnaca, Cyprus), accommodation for two nights, three meals, shopping and airport transfers I managed to keep my budget to £250. The entire city was bathed in Christmas lights - it was super festive! Interesting ceiling decoration at the place we went for brunch - I love the clogs! I love the attention to detail here!